← Vicki’s Bike for Justice 2014: Lost and Found Ministries and Sister Parish, Inc.
Delegates and Guarjila committee members. 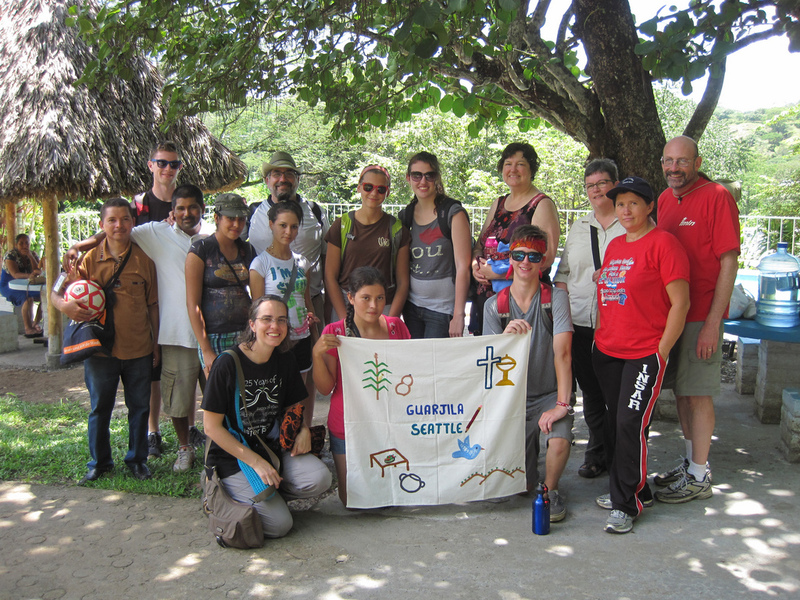 Delegates from Wallingford United Methodist Church visited Guarjila in July of 2013. A number of participants sent the following reflections on their experience. As we traveled home from our recent trip to Guarjila, I was thinking a lot about how to answer the question, “How was your trip?” Or “What did you do while you were there?” What we did, what I did was to experience the most generous, loving, people. What I did was listen to story after story of atrocities, of loss, of oppression, and of an incredible resilience. We walked where people ran for their lives, where massacre after massacre took place and where these lovely people resurrected their town and their lives when they returned from exile out of nothing. We learned of the disappeared and that a few determined agencies – non-government agencies – search for the lost loved ones. We heard a young American Embassy employee suggest everyone should just move on. We learned how our country is complicit in the continued oppression of a people. We heard God’s call again for the people of Wallingford United Methodist Church to accompany the people of Guarjila as they work to save the homes of members of the community, as they work to end the existence of gangs and other 21st century problems. I’d like to take this opportunity to thank the Sister Parish Committee in Guarjila for the time and energy they invested in our delegation’s preparation. To all of you who spent time with us telling of your experiences and helping us to be so completely prepared for our trip – thank you! A special thank you to Tom Pouliot for his generous accompaniment of our delegation. For all he did before and during the trip, we all owe him a great deal. Thank you! 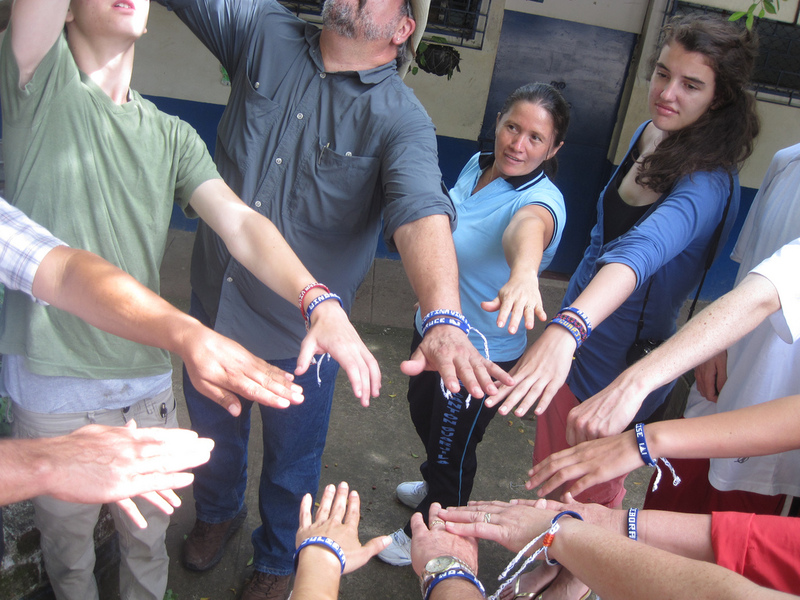 Delegates were given bracelets to remember their experience and their commitment to the relationship with Guarjila. Wallingford United Methodist Church has many important ministries, but surely one of the most important is our Sister Parish relationship with the community of Guarjila Jon Cortina, El Salvador. For the 8th time in 13 years, a delegation from WUMC has journeyed to the rebuilt town of Guarjila. We go there to establish and maintain a faith relationship between our congregation and the people there. I can honestly say from my experience as a first time visitor to El Salvador, that we receive every bit as much reward as do the Salvadorans that we meet, live with, travel with and commune with. Three times, delegations from Guarjila have traveled to Seattle, and I believe that it can also be said that we benefit as a congregation from their presence. I watched the four young people in our group, Abby, Elise, Windsor, and Daniel, grow and expand before our very eyes. I will not be at all surprised if the trip affects important life choices for them, as it has done for many young people who were Sister Parish delegates in the past. Our modest contributions to fund Sister Parish and scholarships in Guarjila reap great rewards in bringing a completely different world view to bear in our lives and in our minds. The people there open their homes and their hearts to us in a way that is emblematic of Christian Love. To see that Love embodied in the so many parts of the lives of the people we meet can only strengthen us and our church here in Seattle. Many of us on the delegation this year have resolved to return again. Watch us Grow before your very Eyes! Guarjila was the best trip I’ve been a part of, and possibly the greatest I’ll ever be on. Never would I have expected the people to be so kind, welcoming, generous and patient (especially with our Spanish) with foreign strangers, giving their time, histories, and homes to our delegation. I learned so much from all who we talked to. From the standpoint of CIS’ and the UCA’s leaders about the war and state of the country to the accounts of people from Guarjila that fought in or survived the war, I learned so much. Even more invaluable than the knowledge of their situation though was the chance to connect with these people who had been through so much. 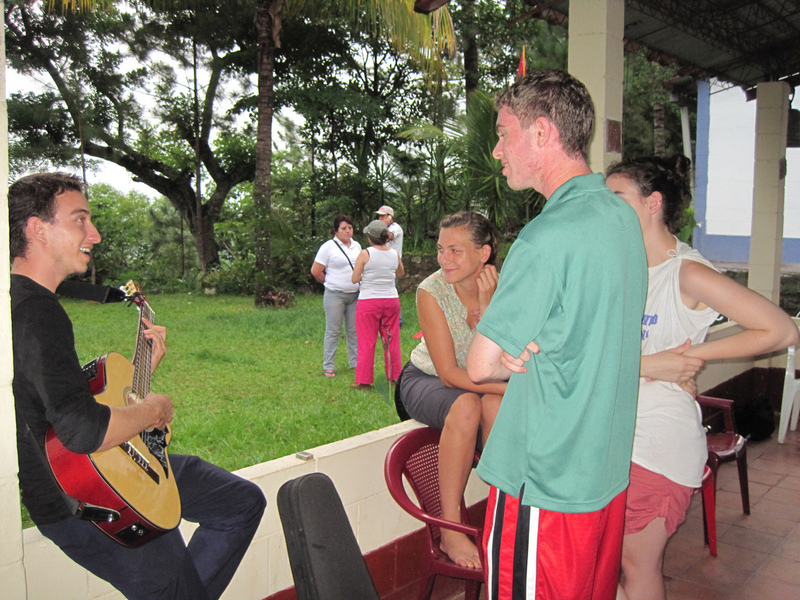 Talking to my host family about the effects of recent changes in the community, listening to the eyewitness accounts of fighting, of massacres, and of being a refugee, talking to a guy my age through broken Spanish and English about the weather, reggae music, and how he was determined to be a better father because of the absence of his own parents throughout his life, and spending half the days there sharing activities with other students was something more personal than I could have ever gotten from reading about what had happened and is happening. Seeing the tears on people’s faces when they talk about new problems in Guarjila, seeing the hope in their eyes despite the change, and feeling the happiness of being part of the relationship between our countries gave me hope for the future and made me thank God that something like this is possible. I come back to the States with infinitely more knowledge about the people in El Salvador, new friends that I never would have imagined I would meet, and most importantly a new family. 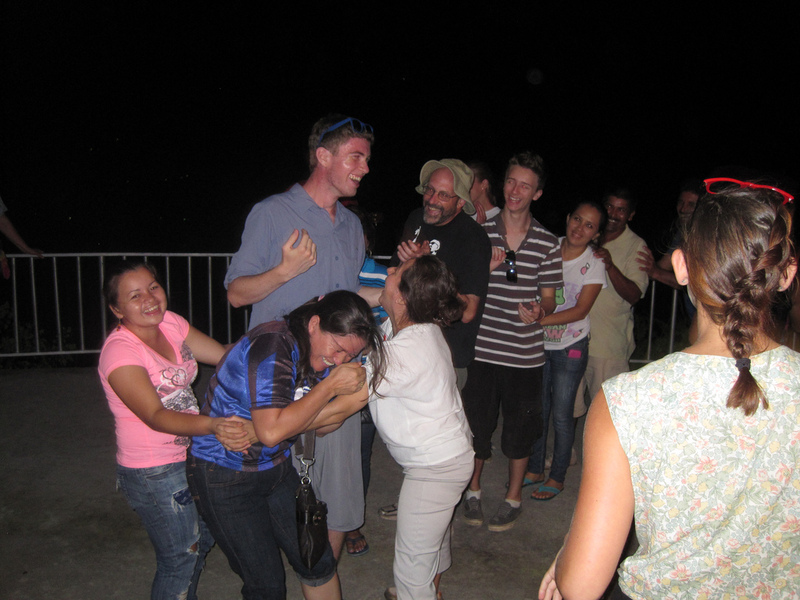 When we actually arrived in El Salvador, it was hot and really humid, as well as crazy busy, and VERY dark. Going around to all the museums and chapels in the first couple days was really interesting. But I really just wanted to go to Guarjila to see what the relationship was all about, and that’s where it really happened for me. I went to Guarjila to grow in my faith. Most people don’t realize how hard it is to believe in God when your parent is a pastor. But when you’re exposed to churchy things your entire life it feels like routine – not this special almighty relationship with the creator. I wanted so badly to fix that, and going to Guarjila where they seemed to believe in spite of major oppression seemed like the best way to do this. Actually getting to Guarjila was very heartwarming. And I know that sounds cheesy. But it was like you had amnesia and you’re surrounded by people who love and care about you but you have no idea who they are. It was like God’s unconditional love came in and swept us off our feet and held us there for the entire duration of our stay. It was absolutely amazing. And even though… I couldn’t get my messages across because I decided to take French instead of Spanish in school – it was the most powerful experience I have ever had. And I’m sure that I grew a lot, both in my faith and as a human being because I’ve realized that we’re all just that – human. Being christian doesn’t mean being perfect and that we don’t ever sin. It means, at least to me now because I’ve experienced this type of Agape, loving people (even strangers and enemies) the way that the people of Guarjila loved us just because we can. The first day I found out that I could go to Guarjila I was very happy but I didn’t know what to expect. My brother, Peyton had gone and very much enjoyed it, so I had some thought of what it might be like. But when we actually landed in San Salvador I was completely blown away – first by the heat and humidity, then by the cultural differences. The third day we were in El Salvador we headed for a community in Chalatenango called Guarjila and that’s where the beauty began. I met my new family. I was cared for and loved like I never have been before. I grew extremely close to people that I never would have, had I not gone on this trip. This experience will definitely be in my heart forever. It has changed my life for sure. There is no doubt in my mind that Guarjila is my favorite place in the world. I would love to go back. This entry was posted in Delegations, El Salvador, General and tagged delegate reflections, delegations, guarjila, wallingford. Bookmark the permalink.